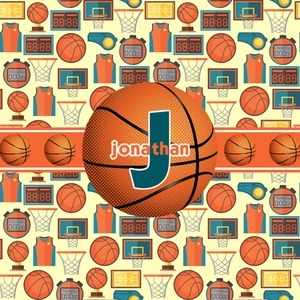 This is a fun design full of basketball graphics! The background has hoops, balls, jerseys, stop watches, and more! The colors are a fun combination of orange, teal, and yellow. The ribbon is orange and white striped with a fun basketball frame to go with it. The coordinating design is also fun with the same pattern but different colors! All elements are easily interchangeable for all of your personalizing needs.